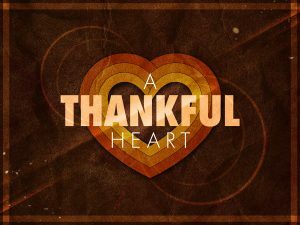 In The Midst Of Your Struggle… Do You Have A Thankful Heart? It was one of those unforgettable moments. I was driving to the hospital on my way to visit Cindy. I remember entering into a period of intense whining. I am a good whiner—some might say even a professional. It was during a particularly dark time in this lengthy ordeal with my beautiful wife’s life-threatening illness. In the midst of my complaining He spoke. It was a tender voice that I knew immediately was my precious Lord. He said, Vince do you have anything in your life for which you are thankful? I am persuaded that one of the very special and pleasing things our Lord experiences happens when we thank Him in the midst of our greatest struggles. It is a powerful demonstration of taking our focus off of our own pain and letting Him know how much we love Him. It is not always easy, however. The flesh is very powerful and the enemy of our soul is always right there telling us what a victim we are and how God really isn’t around to help. Dear friends please allow me to challenge you during this special season. Ask God to help you see your struggles through His eyes. Sometimes the best way to do that is to make a list and begin to recite those things in your life that you are thankful for. I know that some times it is hard to see them through the pain but you must. Trust me on this—it is impossible to thank God for your blessings and whine at the same time—I know—I tried it. What a powerful and beautiful picture of how our heavenly Father literally enters the temple as the result of our praise and thankfulness. Dear ones, remember that Jesus came and died for you and me. When He left the Bible says the temple curtain was rent. This now means He literally comes into our very being—WOW! Cindy and I are so thankful for all of you. May the Lord richly bless you during this Thanksgiving season.